A donut party my daughter says. What? A donut party? I can imagine the confusion on my face, but I reluctantly agree knowing that I was not going to find Donut Party Themed decorations at a local party store. I found something even better than traditional party decorations. 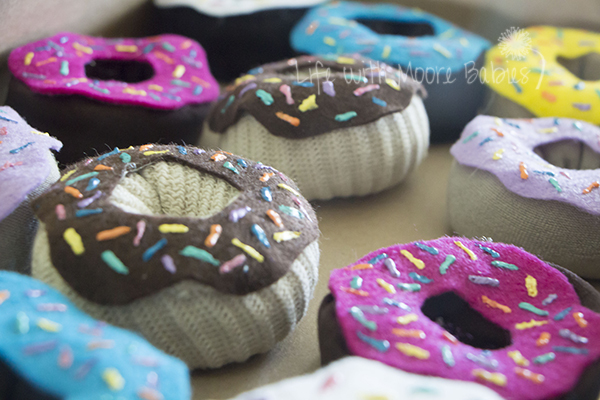 I crafted some Pretend Donuts from socks! That's right, I grabbed some socks from goodwill, washed them (of course), and turned them into cute donut themed decorations that can be reused for pretend play! 1. 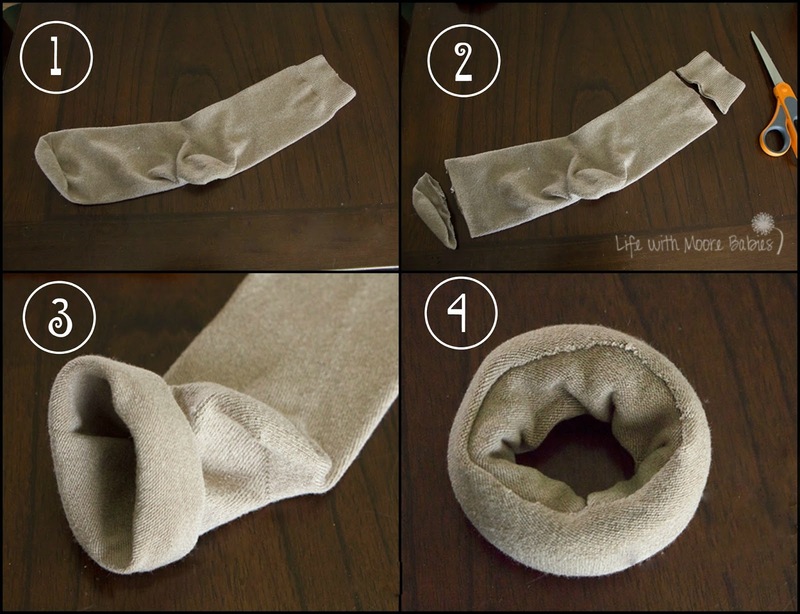 To start with lay your sock flat. 2. Now, cut off the toe and if there is any, the tiny elastic around the top (not the ribbing), do NOT cut off the ribbing or the sock will be too short! 3. Now you have a tube. 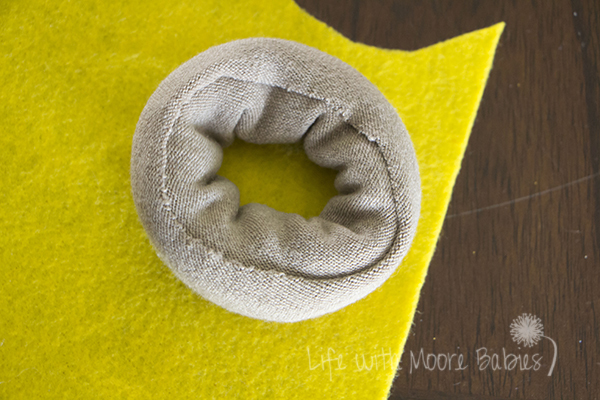 Starting at the toe end, roll the tube into a donut shape. 4. Turn the sock until the edge is located where it will be covered with icing! 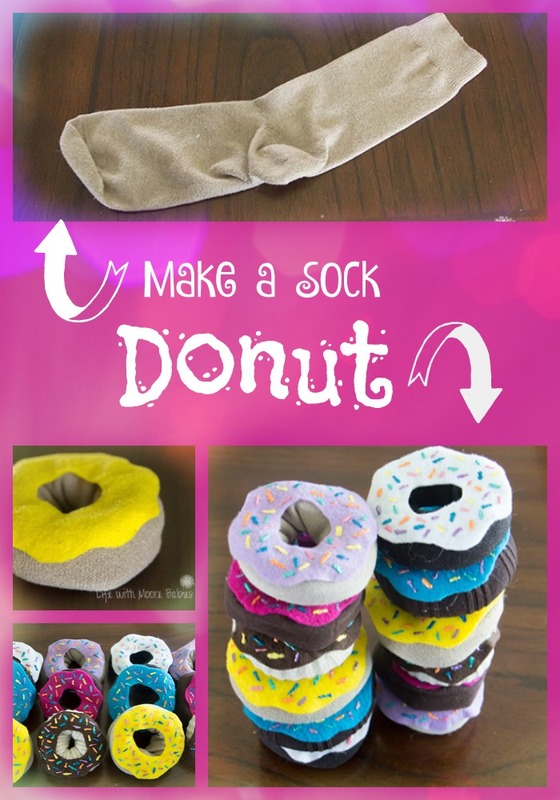 That is the basic donut shape, and you can make it out of all sorts of colors of socks if you want several flavors. I stuck with neutrals, but I did try many weights of socks. The medium weight socks gave the best results although all the socks did indeed make donuts! 5. Time to make the icing! 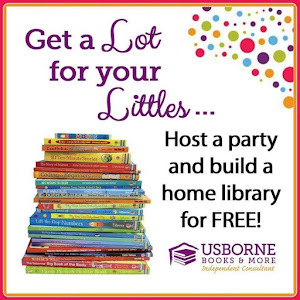 This is where you can really go crazy with colors and cute ideas. 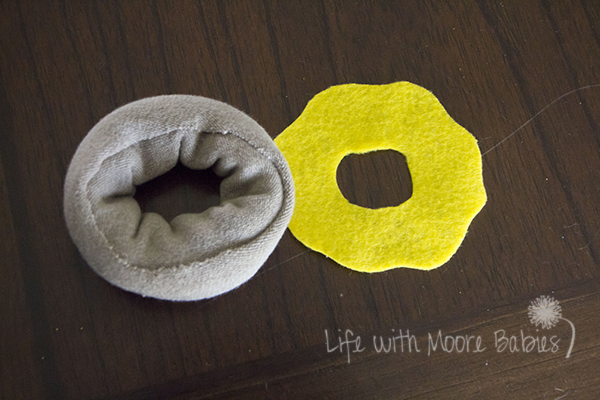 I stuck with bright, solid colored felt, it had a fun feel, and I had it on hand. You could definitely use patterned or textured felt for a different look. 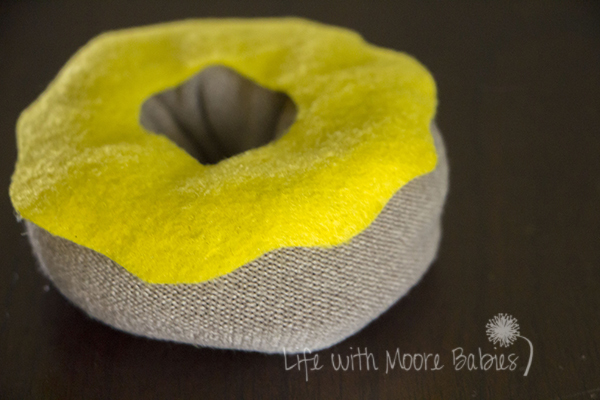 To make the icing, I sat the donut on top of my felt and cut the felt a little larger than the donut. Then I just randomly cut waves along the edges and center to look more like icing. No perfect waves either! Icing drips after all. Using hot glue, glue the felt over the edge of the sock donut. If you didn't already turn the donut to get the edge under where the icing would cover it, do it before you glue on the icing to make sure it is hidden! Once your icing is on, grab your puffy paint to make sprinkles! 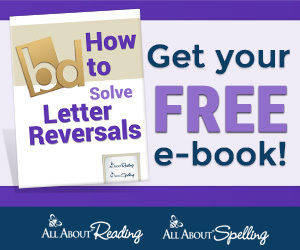 They can be dots or little rods or maybe even squiggles. The sprinkles are totally optional but well worth it, I think. And now after just a few minutes you have a pretend donut! Or if you spent a little more time, you have several. You do have to let the paint dry before playing, though. After they have dried about 24 hours you have finished pretend donuts. Can you even believe they started as socks! Not only that, they were pretty painless to make. Adding a shirt box as a prop just made them that much more appealing. 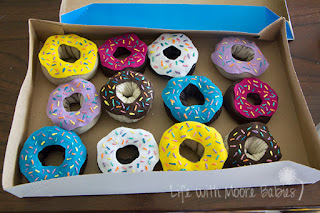 The squeals from my kids definitely proved I made the right decision to make these cute donuts! 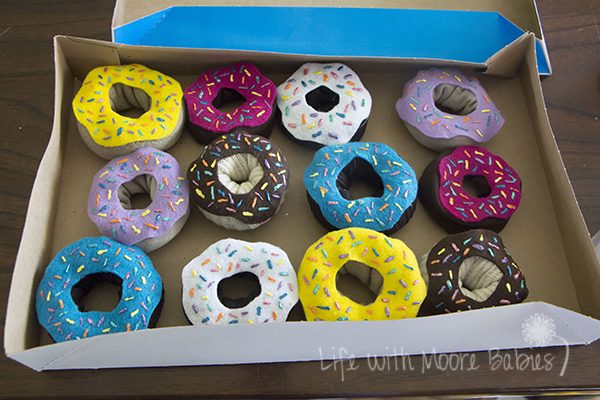 Donut party decorations solved, with no party store involved. These sweet sock donuts also double as pretend food which thrilled my kids! Serving two purposes made the hour or so I spent making them time well spent! 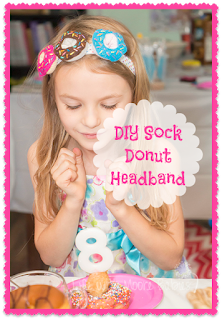 I took the sock donuts one step further and made this cute donut headband! I followed the same steps above, but I used baby socks to get smaller donuts. Then I attached them to a fold over elastic headband. I glued felt circles to the back of the headband to secure the donuts, and presto, cute hairpiece for a donut party! 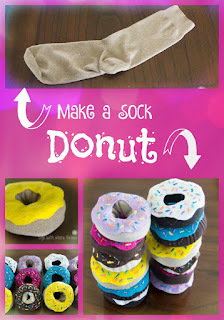 What other ideas can you come up with for these sock donuts?